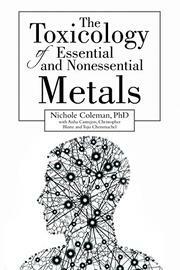 A scientific work alerts readers to the dangers of toxicity caused by metals. When it comes to their effects on humans, metals can be divided into two groups: essential and nonessential. Essential metals are, as their name implies, necessary to the function of the human body. They enter people’s systems through the foods they eat. Nonessential metals, on the other hand, are toxic to human health. Unfortunately, many of these metals still find their ways into people’s bodies as well. “The blades we use, the pots and pans we cook with, face paint and children’s makeup contain numerous toxic metals,” writes Coleman (What’s the Matter? Personalizing Principles of Organic Chemistry, 2015), naming only some of the products many folks handle and consume on a daily basis. With this book, the author seeks to outline for the reader the cause of metal toxicity and the means by which metals contaminate the environment. Even essential metals can be poisonous if they are absorbed in high concentrations. Coleman takes on metals one by one to tell readers if they should or should not be ingesting it, in what quantities, from what sources, and how this affects their health. Everyone knows that arsenic and mercury are deadly, but Coleman introduces readers to the danger of other metals like beryllium, which many industrial works are exposed to, and cadmium, which can be present in rice, cereal grains, and chocolate. The account is based on “a mixture of original research articles, perspectives, and reviews of Internet sources that underscore the dangers of some consumer products.” The somewhat clinical tone recalls the style of a textbook, and the work is organized in a similar way, broken down into sections dealing with each metal. The volume is more an examination of chemistry than a piece of consumer advocacy—few companies are mentioned by name. That said, those interested in making themselves more aware of the metals entering their bodies will find much of interest in these pages and come away with a greater understanding of what metals are and why humans need (or don’t need) them. An informative explanation of metal poisoning.